On a working surface, create a well with the flour and crack the egg in the middle. Then sprinkle with salt and scramble the egg with a fork. Draw flour from the sides of the well into the center, kneading until you get a soft dough forms. Add more flour, if it’s too soft. Keep kneading for 8-10 minutes. Cover the dough and let it rest for an hour or at least half an hour. Cut the circles from which to shape cappellacci. A two-inch biscuit cutter is perfect for the task and actually, in my opinion, more comfortable to use than a glass. Wrap one circle around your index tip to form a cone. Fold back the side of the brim opposite to the seam and press it against the cone, then slide the cappellaccio off the finger and place it upright on a lightly floured working surface, resting on the lateral sides of the brim. Knead together the cutouts and cover them while you work, then roll them again. Continue until all the dough is used. 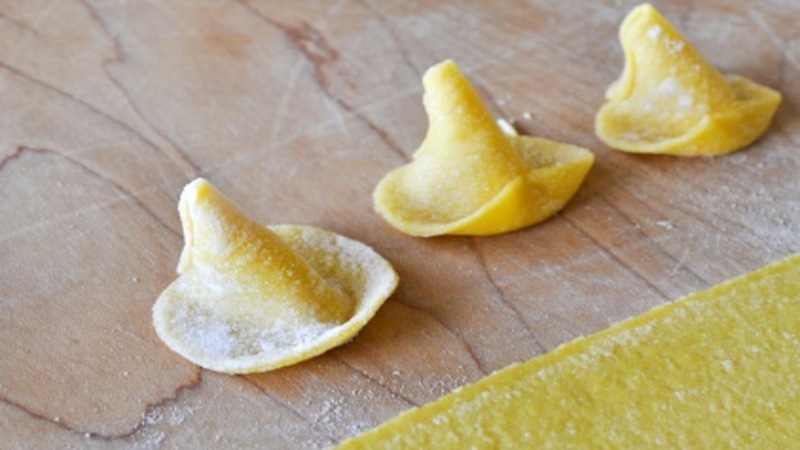 Let cappellacci dry for at least a couple of hours, so they will hold their shape better while cooking. Boil in plenty of salted water. Always handle cappellacci with a delicate touch, when you transfer them into the pot, when you stir them while cooking and then when you dress them. You will be rewarded with a truly pretty plate of pasta that will delight your guests’ eyes and palates. I dress cappellacci with my homemade tomato sauge.